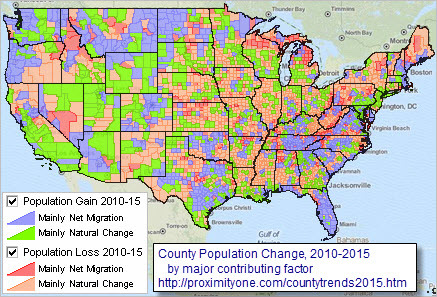 .. examining the how and why of U.S. population change by county from 2010 to 2015. 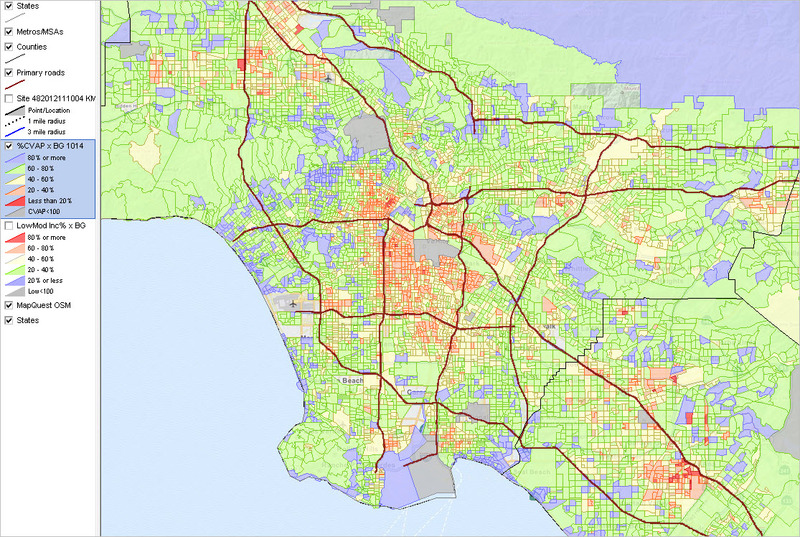 This section provides an overview of this topic and provides a summary of tools, interactive table and GIS project, to analyze population change by county using latest Census Bureau estimates data through 2015. These data are used by ProximityOne to develop/update annual county demographic-economic projections. See related Web section for more detail. The following graphic shows how counties have gained population (blue and green) and lost population (orange and red) during the period 2010 to 2015. Click graphic for larger view; expand browser window for best quality view. Use the interactive table to view population trends and components of change for selected counties. The following graphic illustrates how the table can be used. • Click PopChg 2010-15 header column to sort. Among these counties, Horry County, SC has the largest 2010-15 population change. The peer group counties are shown in rank order. – experiment with settings of interest. .. how are metros of interest changing? The Metro Situation & Outlook Reports provide the premier integrated, multi-sourced demographic-economic overview for individual metropolitan areas. Click graphic for larger view with names. Expand browser window for best view. Label shows metro rank among all 917 metros based on 2015 population. The no fee report for each metro was updated today with the annually updated population and population components of change. 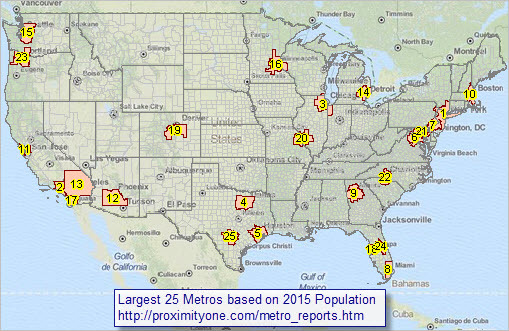 Use this interactive table to view, query, rank metros. Examine total population annually 2010 to 2015 and rankings. Click on a link in the interactive table to view the integrated, multi-sourced demographic-economic Situation & Outlook report for that metro. 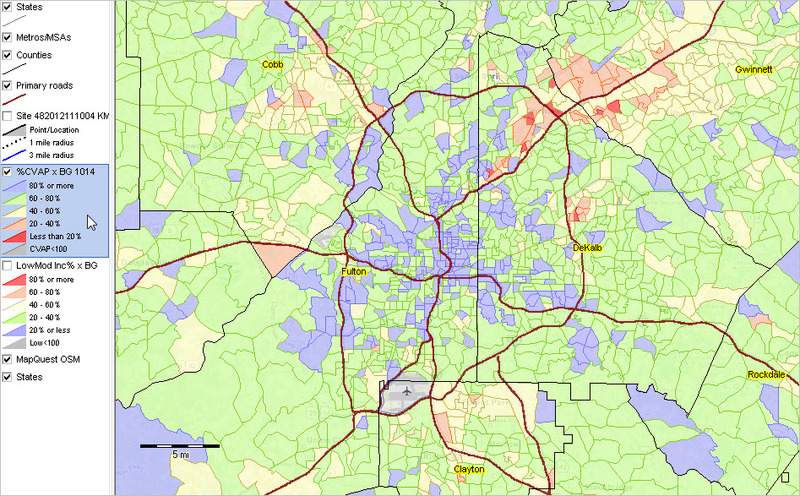 See this example for the Charlotte-Concord-Gastonia, NC-SC MSA. The metro report provides drill-down demographic-economic attributes of metro component areas including counties, cities and school districts. .. tip of the day .. a continuing weekly or more frequent tip on developing, integrating, accessing and using geographic, demographic, economic and statistical data. Join in .. tip of the day posts are added to the Data Analytics Blog on an irregular basis, normally weekly. Follow the blog to receive updates as they occur. .. 5 ways to access/analyze the most recent estimates of median housing value and other subject matter by ZIP Code area .. based on the American Community Survey (ACS1014) 5-year estimates. See related Web section. Click graphic for larger view with more detail. 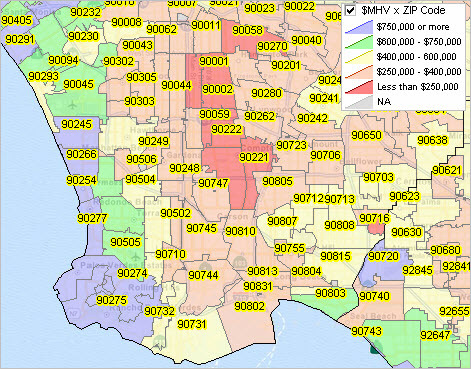 Use the Mapping ZIP Code Demographics resources to develop similar views anywhere in U.S.
– median housing value is item H088; see item list above interactive table. – scroll left on the table until H088 appears in the header column. 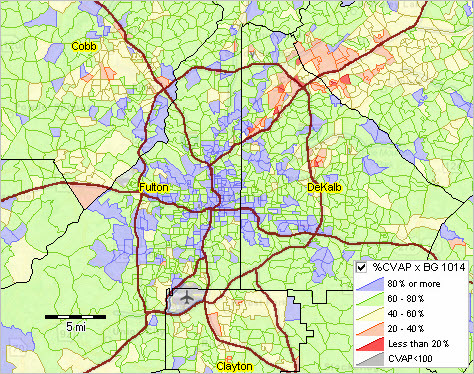 – that column shows the 2014 ACS H088 estimate for for all ZIP codes. – click column header to sort; click again to sort other direction. – see usage notes below table. – develop file containing $MHV for all ZIP code areas in U.S.
– load into Excel, other software; link with other data. – median housing value ($MHV) is item B25077_001E. – click this link to get B25077_001E ($MHV) using the API tool. – this API call retrieves U.S. national scope data. 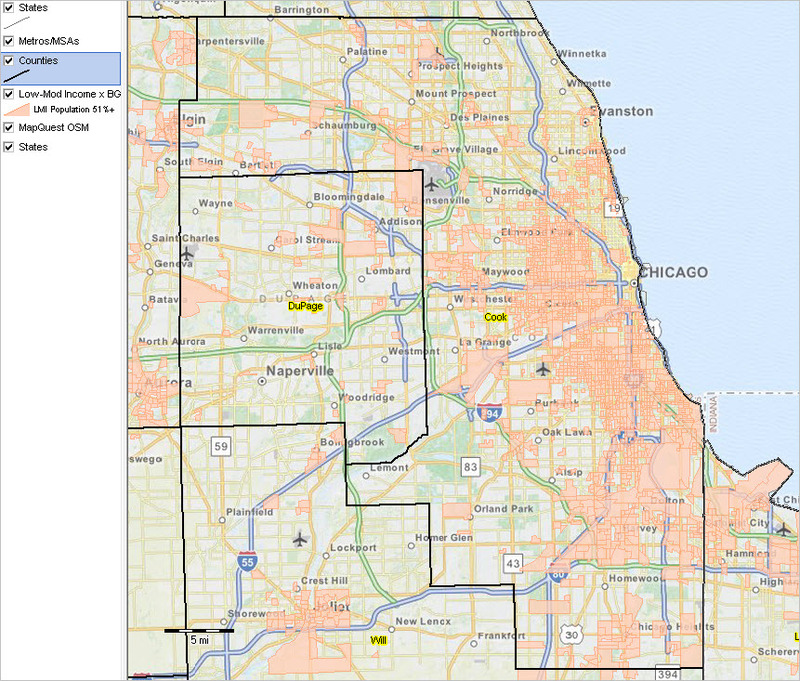 – a new page displays showing a line/row for each ZIP code. 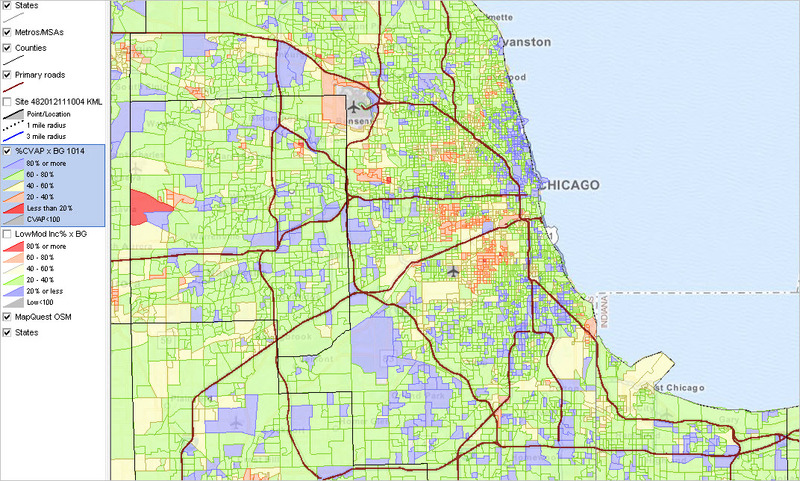 – median housing value appears on the left, then ZIP code. – optionally save this file and import the data into a preferred program. – more about API tools. View additional subject matter options. Option 4. 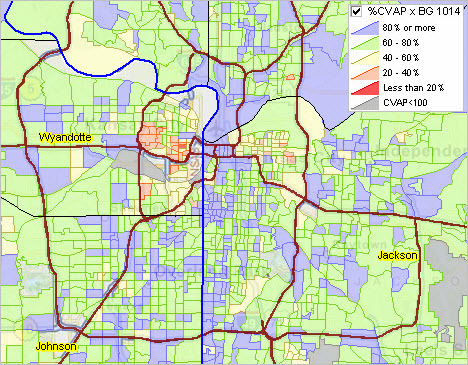 View the $MHV in context of other attributes for a ZIP code. – click this link to select a ZIP code of interest. – for example, this link shows a profile for 80204 (Denver area). – when the report displays, scroll down in table to housing value section. Option 5. View 5- and 10-mile circular area profile from ZIP center. – profile for ZIP 80204 dynamically made using SiteReport tool. – with SiteReport running, enter the ZIP code, radii and click Run. – comparative analysis report is generated in HTML and Excel structure. – Click this link to view resulting profile. – from the profile, site 2 is 1.9 times the population of site 1. – Site 1 $MHV is $296,998 compared to Site 2 $MHV $269,734. – GIS view with integrated radius shown below. This section is focused on median housing value and ZIP code areas. Many other subject matter items will be apparent when these methods are used. Optionally adjust above details to view different subject matter for ZIP codes. .. tools and resources to access and analyze citizen voting age population by block group … ideally analysts and stakeholders will examine patterns and characteristics of the citizen voting age population (CVAP) by block group. 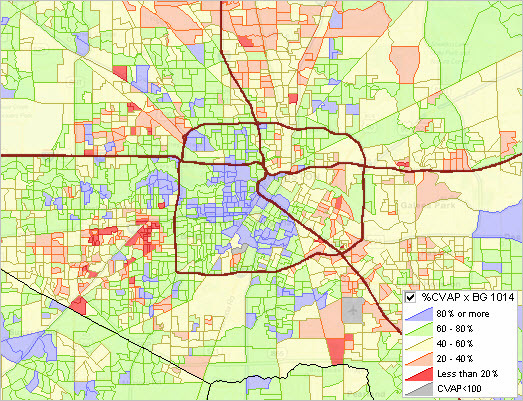 This is partly because of the extreme variability of CVAP within higher level geography — even at the census tract level. This becomes even more important in more densely populated areas. 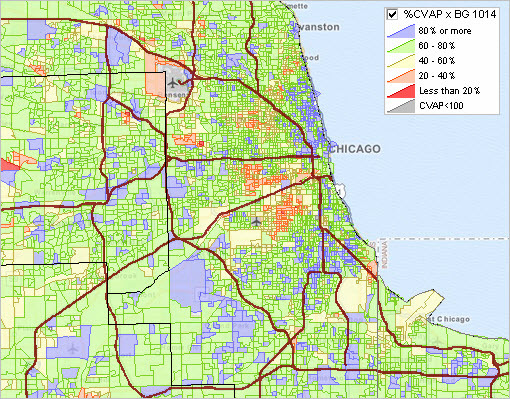 See about ACS 2014 CVAP block group demographics in this related Web section. See legend in lower right of graphic for interval/color correspondence. Click graphic for larger view; expand browser window for best quality view. The size, characteristics and distribution of the citizen voting age population by block group is very important. • Block groups are the most granular geography at which we can study these demographics. • The size of the citizen voting age population ultimately determines election outcomes. 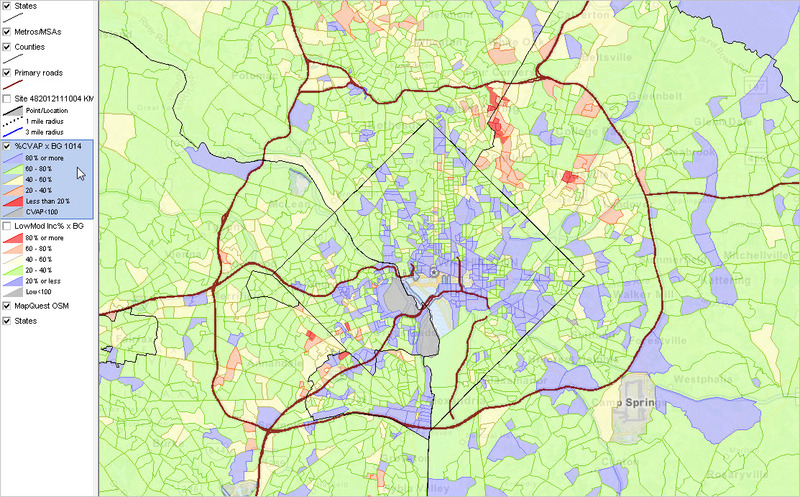 This section provides thematic pattern map views and analyses of selected metros. These applications can be replicated for any area. They serve as an “analytical basis” that can be augmented with other methods and data (e.g., voter registration, voter propensity, voter turnout, and other election factors) to gain insights into election outcomes under alternative scenarios. Equally important, this information can be used to better equip voters with the potential impact of improved voting activity for their own neighborhood and larger areas (e.g., even congressional districts). Contact us (or call 888.364.7656) for maps and analyses for areas of interest or to use the integrated, ready-to-use, national scope GIS software, GIS project and datasets. Add your own data; create custom views. See legend in upper right of graphic for interval/color correspondence. Click graphic for larger view; expand browser window for best quality view. See this blog post in this full, more detailed Web section. .. steps to develop map graphics & visual analysis of market/study areas .. map graphics are an important part of most demographic-economic analyses and essential for many applications. Not only are are maps needed to show geographic boundaries and the relative location of geography within a broader area, they can come alive by showing patterns. 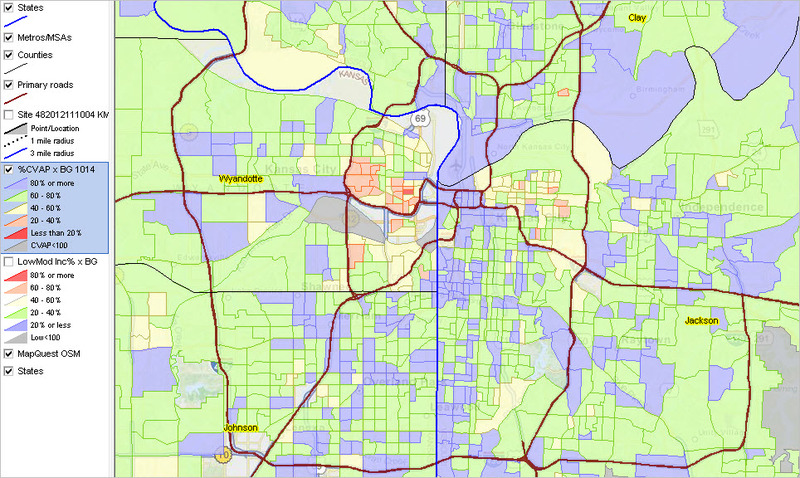 A thematic pattern map of median household income by block group is a good example; higher and lower areas of economic prosperity by neighborhood can be immediately determined. Map graphics can improve our ability to communicate complex information. Convey information faster. Make more compelling presentations. Collaborate more effectively through the use of map graphics. See related Web section for more details. The focus of this section is on creating and using KML files to prepare map graphics for use in developing Market-Study Area Comparative Analysis Reports. These files and map graphics also have broader uses. Steps are reviewed to develop the KML circular area map graphics files, convert them to shapefile structure and integrate both files into mapping and GIS applications and put them into operational use. KML (Keyhole Markup Language) files are XML structured files useful for visualizing geographic objects (like circles) using Internet-based browsers, notably Google Earth. Why develop/use KML files? They are easy to create with precision, there is little to no learning curve, they can be used in many venues and they are free to develop. KML files can be used side-by-side with shapefiles. Shapefiles, structured very much unlike KML files, are the dominant vector-based file structure used in GIS applications involved in both viewing and geospatial analysis. An “objective view” of this section is shown in the following graphic. 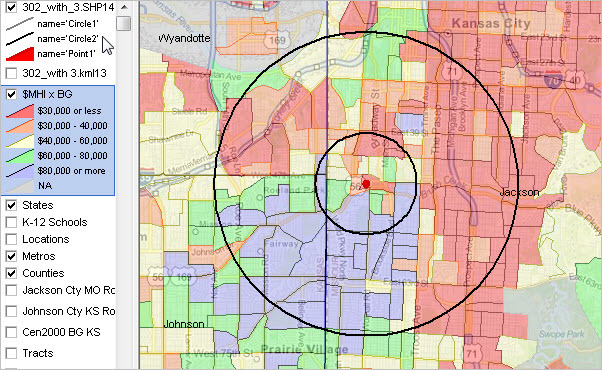 The graphic shows a study site location (red marker), 1-mile & 3-mile radius circles. The site location is a Starbucks located at 302 Nichols Road, Kansas City, MO 64112. 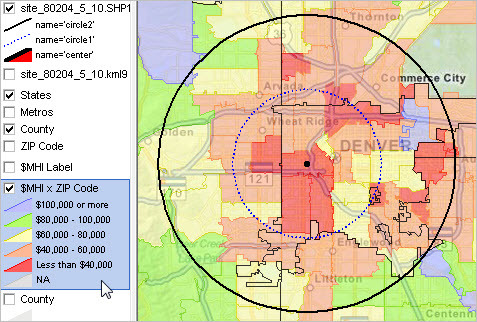 The view shows a circular KML-based graphics in context of patterns of median household income by block group. Develop similar views for any area, any site circular configuration, using steps reviewed in this section. Proceed through the next steps to develop a KML file used to create the graphic below on left — a Starbucks located at 302 Nichols Road, Kansas City, MO 64112. 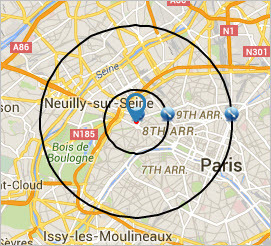 Graphic on the right is a Starbucks location in Paris, used to illustrate this process works globally. 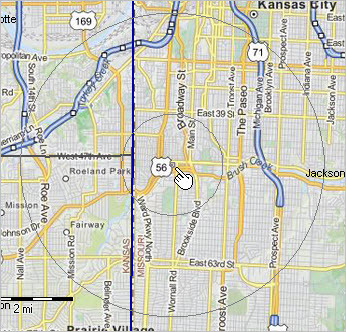 Both graphics include study area center point and 1-mile and 3-mile radius circles. .. see the latitude-longitude (39.041548,-94.592965) in the URL bar. • Open this web page to create the circles & save results as KML file. • Refresh this page if making a new KML file. • Set the colors and lines to medium, blank and clear. • Click Draw Radius blue button (at right of longitude). 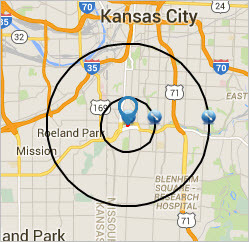 • In the Radius Distance, key in 1.00 miles (use preferred radius for inner circle). 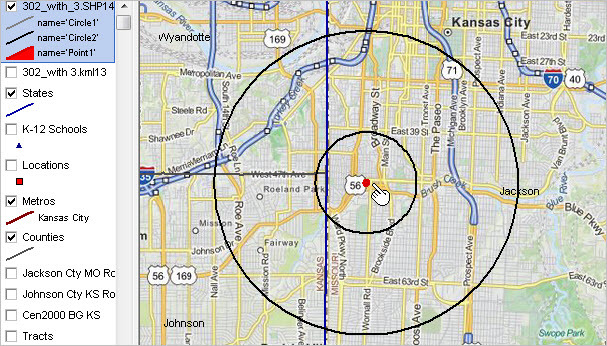 • In the Radius Distance, key in 3.00 miles (use preferred radius for inner circle). .. this step is not required but might be useful to verify the study area appearance. • Navigate down the page to “Google Earth KML Output”. Click the blue button Generate KML. .. save the file as c:\sitereport\302nichols.kml (this file and filename are used below). • The three part KML file has been created and saved to the local computer. • Finished using this browser application. This same process may be used again to create similarly structured KML files of any radius about any point for any location in the world. Optionally create the objective map graphic using the following steps. Or, the KML file may be used with the CV XE GIS software (see below) enabling yet further analytical possibilities. • Click this link to start the Google MyMaps application. • Enter the file path/name as created above (c:\sitereport\302nichols.kml), or any KML file. • Edit the MyMaps rendering to achieve preferred view. • Use preferred screen capture tool to save that part of the map view as a graphic for the study report. • Start the CV XE GIS software and open the project file c:\cvxe\1\cvxe_us2.gis (distributed with installer). .. uncheck Locations and $MHI x BG layers in legend panel. • Select the KML file that was created above (c:\sitereport\302nichols.kml) .. circles appear in the map window. • Navigate to zoom-in view and smaller map window. • Use Toolbar button Save to Image (button 7 from left) to save the map window view to a .jpg file. • Select the KML layer name. • Set Coordinate System edit box value to NAD83. • On the Export Layer/FileSave dialog, select an output file path and name. 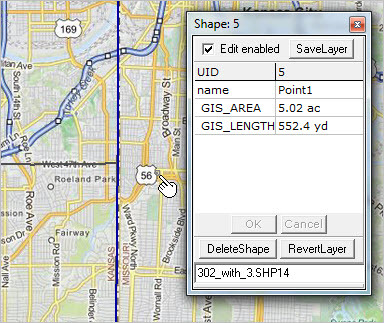 • The shapefile is generated and may be reused with any GIS project. There are three shapes in the shapefile (center point, circle 1, circle 2). Modify the appearance of these shapes/objects by using the Select tool (mouse in Select mode). • In legend panel click on circles layer; name turns blue indicating this is the active layer. • Initially all three shapes have the name “Polygon”. .. change the object names successively to Point1 (the small circle), Circle1 and Circle2. • The shapefile attributes have been permanently changed. 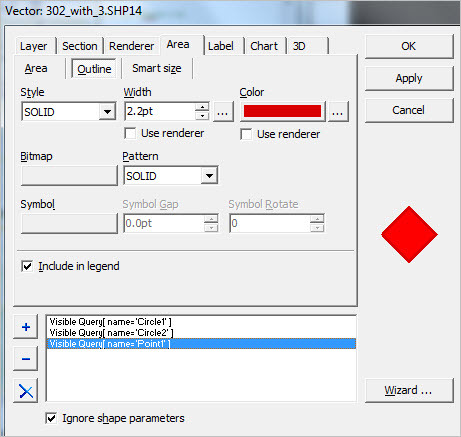 • When each shape/object has been renamed, use the LayerEditor to modify the appearance of each shape. .. the changes modify the project file and not the shapefile. .. optional save the project (overwriting the former version) or save the project with a new name. .. tools and resources to access and use low and moderate income demographics by block group … the U.S. Department of Housing and Urban Development (HUD) sponsored development of the ACS 2006-10 “low and moderate income population (LMI) by block group” special tabulation released in 2015. This is an important data resource for HUD as well as others who need to examine characteristics of the LMI population by block group and related small area geography. See related Web section for more details on topics covered here data. See the related Web section for more detailed information. 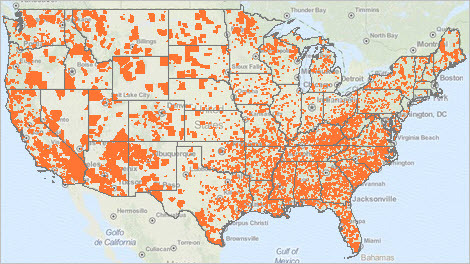 The following graphic shows block groups with 51% or more LMI population with orange fill pattern. See related zoom-in views. Click graphic for broader Chicago area view. Expand browser window for best quality view. There are several features of block groups that make this an important geography for data analytics. Block groups average 1,200 population and are the the smallest geographic area for which the ACS data are tabulated. The approximate 220,000 block groups are subdivisions of census tracts and cover the U.S. wall-to-wall. Only ACS provides national scope demographic-economic data at the block group level. 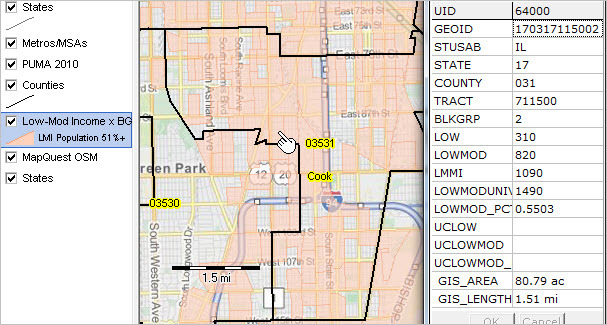 Tools reviewed below make use of one specific block group (170317115002) in the Chicago area. The tools may be applied to any other block group (BG) or set of BGs. Block groups are uniquely identified by the 12 character BG geocode. The BG code 170317115002 refers to block group 2 in census tract 711500 in county 031 in state 17. 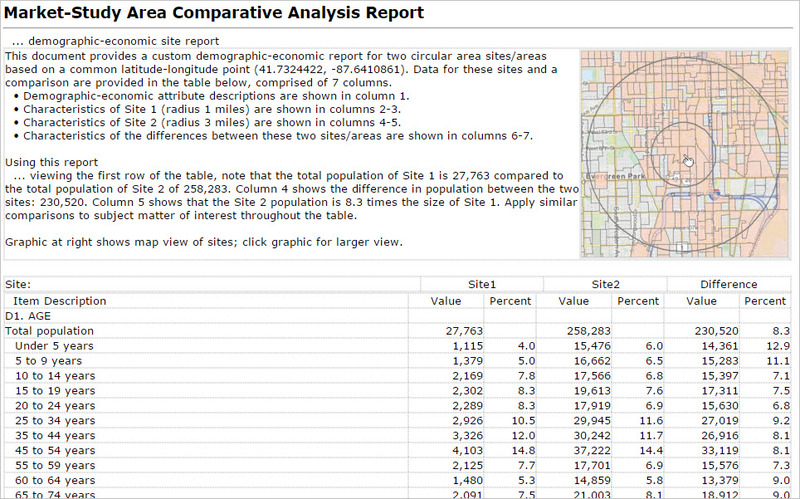 Examine characteristics of circular area reports based on block groups within those areas. The following graphic shows a partial view of a 1- and 3-mile radius report developed for lat-lon location (41.7324422, -87.6410861) BG 170317115002 internal lat-lon. Click graphic to view entire report. This type of report can be prepared for any address/location/lat-lon and area size from less that one mile to many miles. 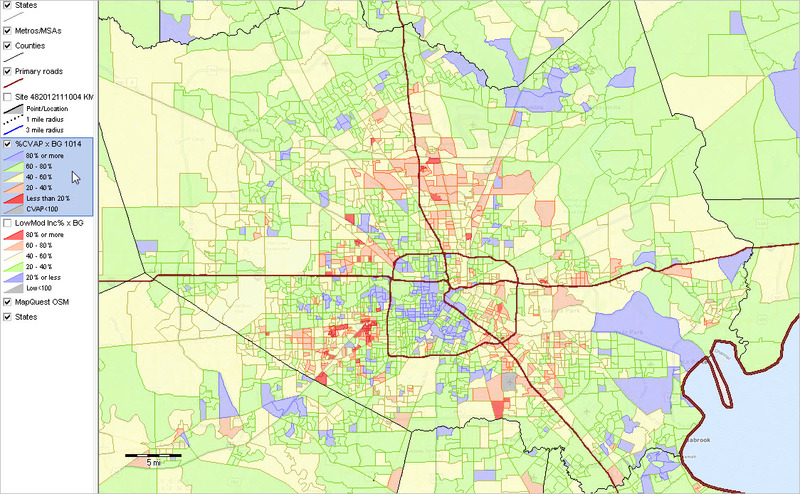 These reports include a much larger set of demographic-economic data than included in the HUD LMISD. The comparative analysis structure makes it easy to compare one site/location with another and their difference. .. report developed with ProximityOne SiteReport. Block groups with 51% or more LMI population shown with orange fill pattern. Mini profile displayed for block group at pointer – 170317115002 – find in table below. LMI percent shown as 55.03%. LMI-BG layer shown in context with Public Use Microdata Area 03531. Develop custom estimates of the population for this PUMA using the ACS PUMS data. Integrate other types of geography and data. Click graphic for broader Chicago area view. Expand browser window for best quality view. See more information here about using the GIS project used to develop maps in this section and more generally develop your own maps and perform geospatial analysis. Use the interactive table to view, query, rank and analyze LMI demographics by block group. The following graphic illustrates one application. The state of Arizona is selected using the state selection tool below the table. The Low Income column header cell is dbl-clicked, sorting the table on the estimate of the Low Income population by block group. It is easy to see that BG 040270116002(blue highlighted) has the largest Low Income population among all BGs in Arizona. Try using the interactive table for geography of interest. The interactive table is a very useful tool when used in combination with the GIS application. What’s next is data integration. Upcoming posts will review similar, but different, updated block group demographics and their use with data reviewed here. See the main block group Web page. … examining demographic-economic characteristics and patterns of the United States … the United States median household income was $51,371 in 2012 and $53,657 in 2014 — a change of $2,286 (4.5%). These are the most recent estimates and based on the American Community Survey (ACS). What about other attributes? The population who spoke a language other than English “not very well” in 2012 was approximately 25 million — that number increased by approximately 500 thousand between 2012 and 2014 — an example of other subject matter. The table and data provided in this section provides much more detail. This section can be a handy reference. Bookmark the related full Web page. ACS provides annual data. Data for 2012 and 2014 are used here as 1) the 2014 data are the most recent and 2) comparing change over two years might provide improved insights as compared to a 1-year change. The Census 2010 population of the United States was 308,745,538. 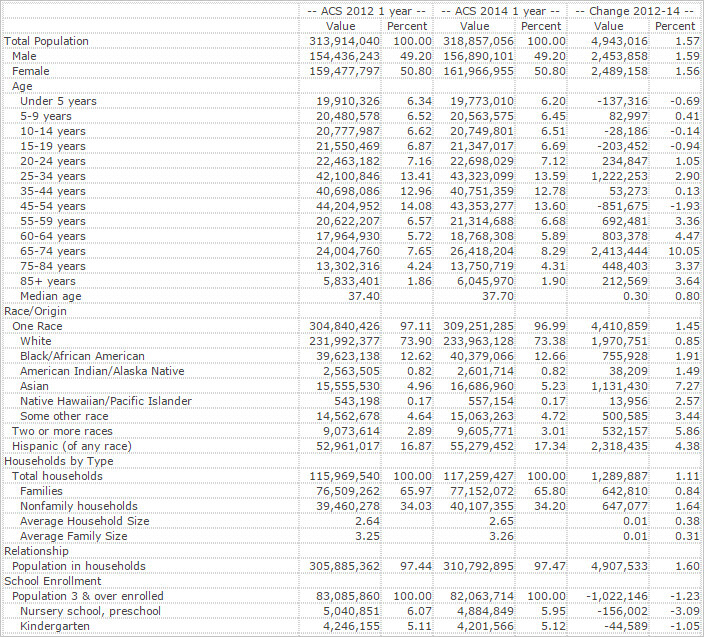 The table shown below provides updated demographics developed by ProximityOne using data from ACS. For areas of 65,000 population or more, ACS 1-year estimates are tabulated, as shown in this table. For smaller population areas (and for all areas), ACS 5-year estimates are also tabulated. All ACS data are estimates and subject to errors of estimation and other errors. See more about comparing these data over time. Below is a graphic illustrating the table. Click graphic to view entire table.